This recipe, adapted from Paul Donaghue, serves four people as an appetizer or side salad, with leftover dressing. Heat 2 tablespoons olive oil in a skillet over medium heat. Add the onions and cook until well browned, about 10 minutes. Transfer to a bowl and cool to room temperature. Blend the onions with the remaining dressing ingredients with a blender or immersion blender. Meanwhile, cook the pancetta in a skillet over medium heat until crisp. Remove to a plate. Add the hazelnuts to the skillet. Toast, stirring frequently, until fragrant and lightly browned. Toss the greens lightly with dressing, starting with a couple of tablespoons. (Please, as Helen Rennie taught us, use your hands for the tossing.) 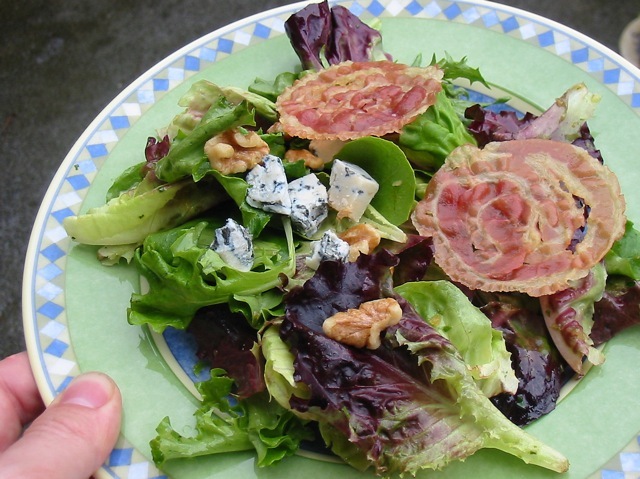 Divide the salad between four plates and top each with cheese, nuts, and two rounds of pancetta. Matthew Amster-Burton takes on his fear of salad in "The omnivore's salad."